In the fall of 1833, Elias Alley, a tanner, currier and shoemaker, came from upstate New York to Detroit and then made the two-day journey along the Sauk Trail to settle in what would become Somerset Township. Today, Somerset Center is a charming rural crossroad that is home to what is arguably Michigan's most whimsical and best-kept secret: McCourtie Park. W.H.L. McCourtie made his fortune in Texas oil before returning home to Somerset. 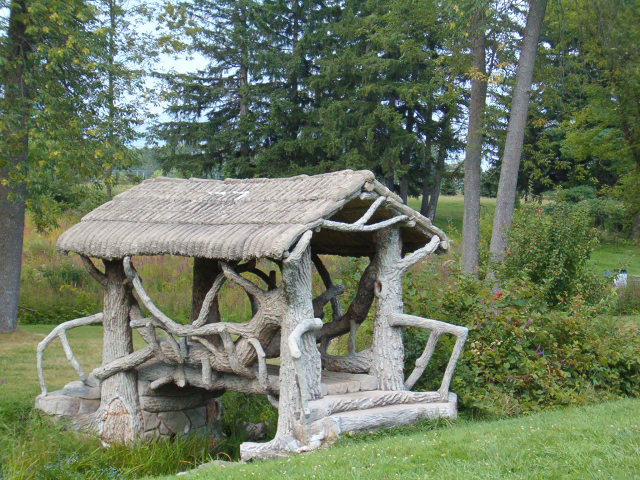 As owner of the defunct Trinity Portland Cement Co., McCourtie had a fondness for concrete and whimsy, and his estate, known as Aiden Lair, was the perfect place to create a fantastical garden. Visitors will be charmed by the 17 cement folk art bridges that cross a meandering stream on the 42-acre property. Built in the early 1930s, these unique faux bois (fake wood) sculptures were created by Mexican artisans and look much like a fairy tale run amok. Look for cement chimneys created to look like tree trunks that rise out of an underground rathskeller built into the side of a hill where McCourtie played poker with Detroit bigwigs like Henry Ford. Local lore says underground tunnels allowed bootleggers to smuggle in liquor for those all-night poker games. Located on the northwest corner of US 12 and South Jackson Road, admission to McCourtie Park is free. For more natural wonders, visit the headwaters of the Grand River, Michigan's longest river, which begins at natural springs in Somerset Center before winding its way to Lake Michigan. Before roads, canals, and railroads, the Grand River was an important navigational route through the lower peninsula of Michigan and used for centuries by various Native American tribes and later by explorers, fur traders and white settlers. The River Raisin watershed flows in the opposite direction to empty into Lake Erie.